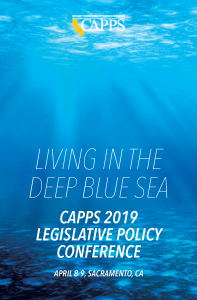 The 2019 awards were presented on April 9, 2019 in Sacramento at the CAPPS Legislative Policy Conference. Each award winner produced a short video presentation highlighting their community service initiatives. Watch the videos and see the list of winners and nominees here. This is the only Conference that allows California schools to hear the latest information about current State, Regulatory, and Federal issues in real-time. The California State Legislature has passed, or attempted to pass, a number of bills that would limit or close schools. You must know what is coming and how to help keep your schools in operation. We have a new Governor and many new Legislators. You should know who these new Legislators are, and how you can successfully interact with them. There will be an opportunity on Tuesday afternoon (April 9) to visit the Capitol (with another school or by yourself) and talk to the Legislators in your district. We are living in a new time of unconstrained policy ambitions. You may not want to hear about where our State is headed, but it is critical that you do so. School registration includes one attendee badge; all conference sessions on Monday and Tuesday; Monday afternoon break, Monday evening Welcome Reception, Tuesday breakfast, Tuesday morning break, and Tuesday lunch. Open to CAPPS Members only. There are 3 spots still available. Exhibitor registration includes: two attendee badges (each additional badge is $415); one 6' table-top exhibit space; all conference sessions on Monday and Tuesday; Monday afternoon break, Monday evening Welcome Reception, Tuesday breakfast, Tuesday morning break, and Tuesday lunch. Non-exhibiting vendor registration includes one attendee badge (each additional badge is $415); all conference sessions on Monday and Tuesday; Monday afternoon break, Monday evening Welcome Reception, Tuesday breakfast, Tuesday morning break, and Tuesday lunch. Please note that the program below is subject to change. Name Badge Sponsor $1000 - SOLD! Thank you to National Center for Competency Testing! Opportunity to include company promotional materials at the CAPPS Registration Desk. Recognition in all conference promotional materials. Tuesday Break Sponsor $1000 - SOLD! Thank you van Rijn & Associates! Recognition on Tuesday’s Breakfast signage. Recognition on Tuesday’s Luncheon signage. Welcome Reception Sponsor $5000 - SOLD! Thank you to Elsevier! Recognition on Monday evening’s Welcome Reception signage. Opportunity for company representative to speak at the conference (5 minutes maximum) at the Monday afternoon opening. Invitation for company representative to attend the Monday night VIP Appreciation Dinner hosted by Duane Morris LLP.